Phoebe Wood is back with delicious. as Food Director after a three year hiatus that included a sojourn in New York, a stint on Masterchef TV and several years as Food Editor at SBS Feast magazine. After years in hospitality working at celebrated Sydney restaurants such as Spice Temple, Sails on Lavender Bay and Duke, Phoebe began her career in food publishing in 2009 as delicious. Food Assistant. After working her way up to Assistant Food Editor at delicious., Phoebe left Sydney to embark on a holiday in New York, with the aim of eating a doughnut a day and researching her cookbook on American pie. She returned to Australia to work in the MasterChef Australia test kitchen, then took on the role of Food Editor at SBS Feast magazine, where she was able to realise her global experiences and appreciation of food. Now she has come full circle to return to delicious. creating impressive yet effortless recipes for our print and online audience, be it entertaining feasts, quick fast family dinners and wicked cakes and pies. 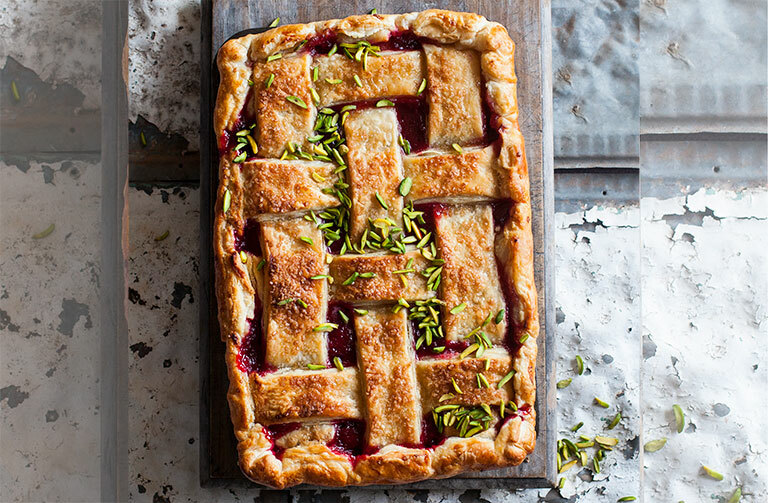 An avid baker, Phoebe found a new love for a classic American pie crust in the States and savours the challenge of turning whatever is in her fridge into an artful and beautiful cake. Follow @phoeberosewood for regular updates from her kitchen. To make the pastry, combine the flour, sugar and salt in the bowl of The Bakery Boss and fold on speed 1 for 10 seconds. Add the butter, increase to speed 2 for 60 seconds or until mixture mostly resembles fine breadcrumbs (leave some large chunks of butter as this will help the pastry to become nice and flaky as it cooks). Slowly add the vinegar water and fold on speed 1 until the mixture begins to form a rough dough (you may not need all of the water), about 20 seconds. Divide the dough in half, shape into rough discs and wrap in plastic wrap. Chill for 3 hours. Roll out one piece of pastry to a thickness of 3 mm (1/8 in). Use the pastry to line the base and sides of a 28 cm × 17 cm (11 in × 6¾ in) pie dish, leaving a 3 cm (1¼ in) overhang. Roll out the second piece of pastry to a thickness of 3 mm (1/8 in) and cut into seven 5 cm (2 in) thick strips. Chill both for 30 minutes. Combine the rhubarb, caster sugar and orange zest and juice in a saucepan over medium heat. Cook, stirring occasionally, for 15 minutes or until the rhubarb is soft and the juices are reduced. Remove from the heat and leave to cool completely. For the frangipane, place the butter and sugar in the bowl of the Bakery Boss and cream on speed 8, using a scraper beater until pale. Reduce to speed 5 and mix in the sour cream, egg, egg yolk and the vanilla for 30 seconds, add the pistachios and flour and continue to mix for 20 seconds or until mixture is well combined. Spread into the base of the prepared pie dish and top with the rhubarb mixture. Make a lattice top with the chilled strips and place it on top of the filling. Trim off any excess pastry from the strips then fold over the overhanging pastry to conceal the ends of the lattice and to seal. Brush with the egg wash and scatter with demerara sugar. Place on a baking tray and bake for 45 minutes or until golden and bubbling. Rest for 30 minutes, then scatter with the slivered pistachios before serving. The photograph and recipe was contributed to Food Thinkers by Phoebe Wood .